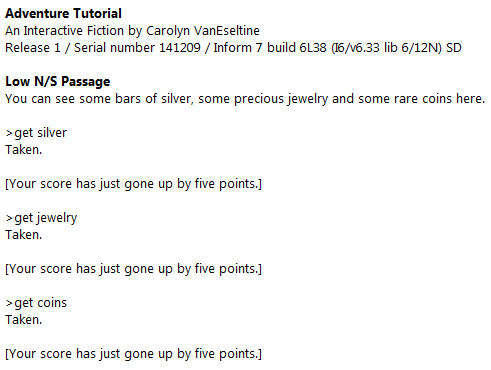 This is the sixth in a series of quick-start Inform 7 tutorials using examples from Colossal Cave Adventure. More information about this tutorial series can be found here: A Quick-Start Guide to Inform 7. The maximum score is 350. Some bars of silver are a thing. The bars of silver are in Low N/S Passage. There is a small problem with the syntax above – not a programming problem, but a design problem. 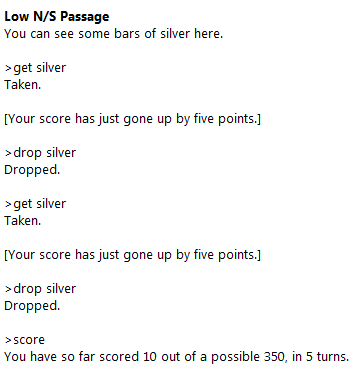 The score increase triggers every time the player takes the bars of silver. This kind of abuse can be avoided in a few ways. The best way for this exact example is probably to use the built-in property “handled”. Another way to handle this is to add new properties. 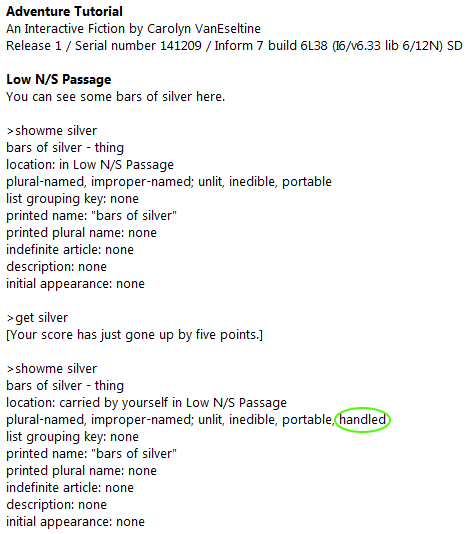 Here, I’ve added the “scored” property to the bars of silver. Some bars of silver are a thing. The bars of silver are in Low N/S Passage. The bars of silver can be scored or unscored. The bars of silver are unscored. It’s all very well to put “scored” and “unscored” on the bars of silver. But there are many treasures in Adventure, and adding a new property and an “after” rule for every single one would be extremely cumbersome and dull. The items you’ve been creating – the wicker cage, the little bird, the tasty food, the bars of silver – are all things. They share certain properties, such as edible/inedible, and certain fields, such as the initial appearance and the description. When we created the wicker cage, we didn’t call it a thing – we called it a container, instead. A container is a kind of thing. It has all the properties of a thing, but it has additional properties that belong specifically to containers. Similarly, when we created the little bird, we called it an animal. An animal is a kind of person, and a person is a kind of thing. An animal has all the properties of things, plus the properties of people, plus the properties of animals. 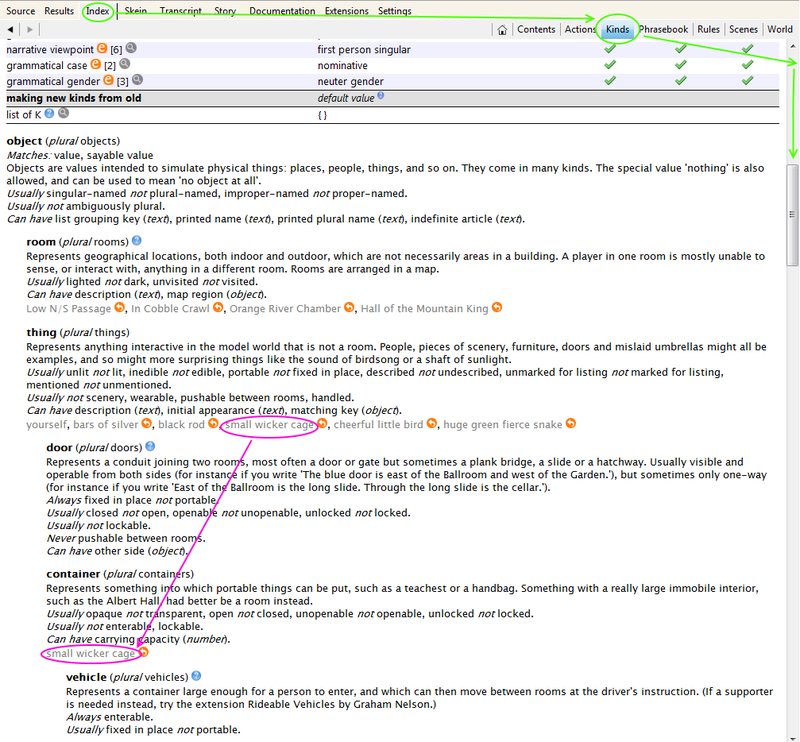 You can get a detailed look at all of the kinds in the game by going to Index, to Kinds, and then dragging down. You can also see every representative of every kind listed there – so you can see the wicker cage listed under containers, and also under things. You are not limited to the kinds that are pre-populated in Inform. You can create new kinds from any of the existing kinds, or from any new kinds that you create. In this case, let’s create a new kind of thing called treasure to make treasure scoring easier. 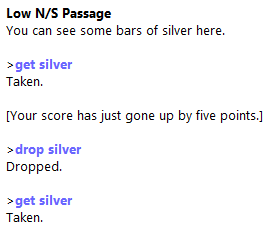 By transferring all the rules from the bars of silver onto the new treasure kind, we can create a template that will affect any other treasure we want to create. A treasure is a kind of thing. A treasure can be scored or unscored. A treasure is usually unscored. Some bars of silver are a treasure. The bars of silver are in Low N/S Passage. Some precious jewelry is a treasure. The precious jewelry is in Low N/S Passage. Some rare coins are a treasure. The rare coins are in Low N/S Passage. And that will work just fine. Note that the words “the current treasure” could be anything – “the loot”, “the grabbed thing”, “your hippopotamus”. It’s just a temporary variable to indicate which treasure you mean. Why specify “(called the current treasure)” at all? Why not just say “if the treasure is unscored” and “now the treasure is scored”? First, “now the treasure is scored” won’t compile. The game has to know which treasure should be scored. It won’t pick one at random. Second, “if the treasure is unscored” is equivalent to “if a treasure is unscored” – which is true if any treasure is unscored, not just the one being handled. This will compile, but it can lead to some truly devious bugs. Being specific is better. The full mechanics for ending a game of Adventure are fairly complex, seeing as they involve orange smoke. But most games do need an end, and since this is a quick-start guide, this will be a quick-end game. Like every other instruction to be carried out during play, ending the game needs to be built into a rule. I’m going to build it into our existing treasure setup, just to make life easy. There are some fine-tuned variations available in endings, such as the difference between ending the story (which can be reversed) and ending the story “finally” (which cannot, and potentially reveals hidden menu options to the player), but these are beyond the scope of this article. Keep up with the fantastic tutorials if possible. I realize it is a lot of work putting it on the internet. Your efforts are appreciated by the IF community. I’ve been delayed by illness lately (going to be posting a little more about that later today) but as we go into the new year, I’ll get back in gear with the tutorials.